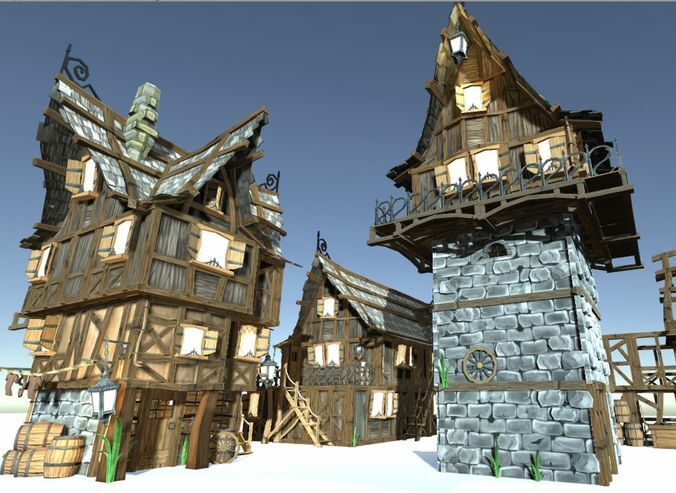 This asset package is for all developers of games and 3D animations who are looking for efficient architectural models in the style of the European Middle Ages. The package is modular, so you are independent and your buildings can be individually and creatively designed. From over 20 different house elements (walls and roofs) you can choose exactly what your middle-aged scene needs. All elements are designed to be used as a facade and as an interior. In addition, the pack comes with over 20 items that make your buildings prettier and more interesting. The modular system of this asset also helps to keep the file size of the resources in the storage as well as in the memory small. The meshes of this asset are all kept very low poly. All textures are hand painted. Whether you're composing a thrilling interior, or planning an exciting city setting: this package meets both requirements. This is terrible. Poorly put together, textures are everywhere and named wrong, and the renders do not match the quality. Very poor.